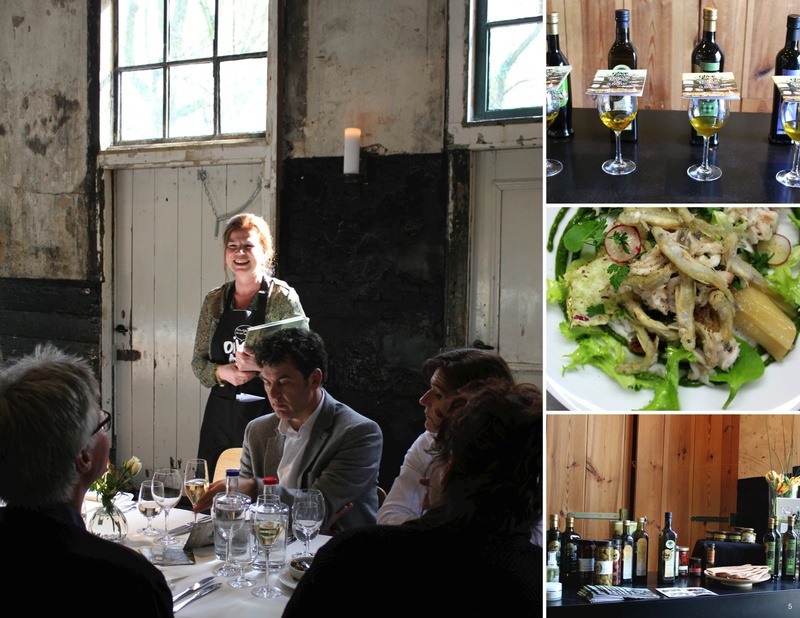 All about olive oil – Last Tuesday I spent an afternoon tasting beautiful olive oils at Restaurant Merckelbach in Amsterdam. 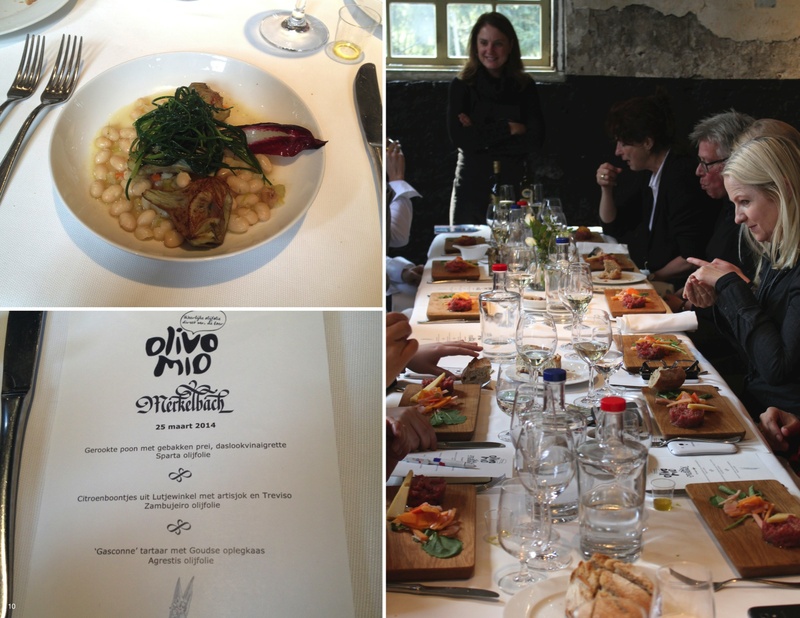 The event was hosted by Olivomio, a local business founded by two women with a passion for slow food and olive oil. Olivomio sells a wide range of high-quality organic olive oils from small, independent sustainable farmers from Italy, Spain and Greece. I first came across Olivomio‘s olive oils at the Lindenhoff market where I bought an extra virgin oil specifically for the preparation of sweet dishes like my Bergamot Almond Cake, Polenta Thyme Cake or Lemon Lavender muffins. 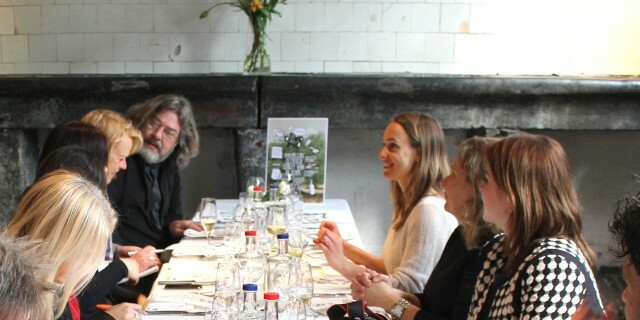 At Restaurant Merckelbach, we tasted different olive oils individually but were also served a three-course menu by Restaurant Merckelbach‘s chef Geert Burema which beautifully highlighted the strengths of each of the oils. Burema, like the entrepreneurs behind Olivomio, is an advocate of the slow food movement and his food creations revolve around the use of clean, seasonal and honestly sourced ingredients. The food he presented to us was simply beautiful. I have always been a big fan of olive oil and I love to use it for cooking or to drizzle some oil on a simple salad. A great olive oil is great on its own, dipped in some plain saltless bread as the Umbrians do, but can be absolutely magical to enhance the flavour of simple dishes, like grilled asparagus or a simple pasta. As a child, I spend most of my summers in the Mediterranean. I have always enjoyed the simple, pure, no-fuss flavours of Mediterranean cuisine. The simply joy of a piece of crispy, fresh bread soaked in a grassy, full-bodied olive oil with some coarse sea salt or a simple Greek summer salad with succulent, ripe tomatoes and cucumber slices drizzled in a rich, herbal olive oil. At home, I always use a cold-pressed, extra virgin olive oil, both for my salads and for my cooking. At the end of this post, I will go in more detail into the safety of using extra virgin oil for cooking. There are so many varieties when it comes to olive oil, from delicate and mild oils to fruity and fragrant, leafy and grassy and strong and spicy. I like to use a mild, flowery extra virgin olive oil for baking cakes and muffins. I like using a full-bodied, rich, grassy olive oil for my salads. One of my favorite olive oils during the tasting session at Restaurant Merckelbach was a Greek oil, called Sparta, which had an intense, herbal and grassy flavour with a mild aftertaste. Another one of my favorite olive oils was a strong, peppery olive oil from Sicily called Agrestis, It had pretty strong aftertaste, which made some people cough as it caused a slight stinging sensation in the back of your throat. It may seem strange but this is actually a good sign. In general, a rich intense flavour and aftertaste indicates a high nutrional content. Many antioxidant and anti-inflammatory compounds are present in olive oil, including phenols, which are -amongst other compounds- responsible for the rich flavor of the oil. As a health coach, my clients always ask me what fats to include in their diet. The two oils I use most in my kitchen are extra virgin olive oil and unrefined coconut oil. I never really cook at a high heat or deep-fry foods. Most of my clients are surprised when I recommend cooking food in extra virgin olive oil. My reason for using extra virgin olive oil is its nutrient richness. Olive oil is celebrated for its many healthy benefits. It is rich in heart-healthy nutritional compounds, antioxidant and anti-inflammatory nutrients that help prevent oxidative stress and reduce the risk of cardiovascular disease. One of the key antioxidants in olive oil, phenols, help protect the cells that line our blood vessels from being damaged by oxygen molecules. Olive oil also provides antioxidants in the form chlorophyll (the green pigment), vitamin E and beta-carotene. Olive oil has also long been recognised for its high content of oleic acid, a monounsaturated, omega-9 fatty acid. Oleic acid has been associated with decreased blood pressure, lowering of bad cholesterol and an optimal balance of total cholesterol, LDL cholesterol and HDL cholesterol in the body. Research suggests that polyphenols also support a healthy gut, protecting our digestive tract by balancing the bacteria in our digestive tract and fighting of harmful bacteria. To ensure you are receiving the most benefits from your olive oil, choosing the right oil is important. 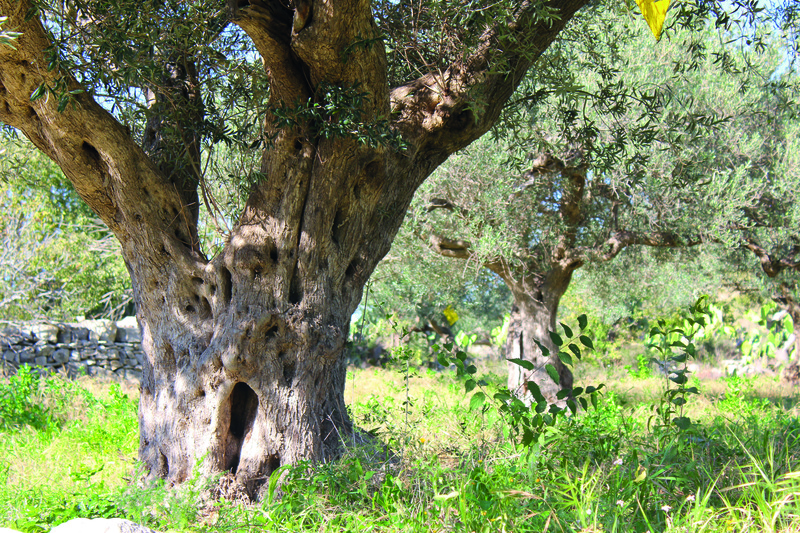 Many factors play a rol in the preservation of the beneficial nutrients in olive oil, including the weather, time of harvesting, the care the farmer puts into the growing and harvesting of the olives, the land the olive trees grow on and the variety of olives used. Another major factor is the quality of olive oil production – the stage and method of pressing but also the time spent between the moment of picking the olives and the actual pressing. Olive oil is made from the crushing and subsequent pressing of olives. Olive oil is available in different grades, which reflect the degrees of processing. The less the olive oil is processed, the closer to its natural state, the healthier and tastier the oil. Most olive oils you can buy in your local supermarket are refined olive oils, blends of different refined and unrefined olive oils. Due to the heavy processing (chemical treatment) of these oils, they have lost most of their nutrient content, their antioxidant and anti-inflammatory properties, and their delicate flavour. Extra virgin olive oil is derived from a first (single) pressing of the olives and has the richest flavour and strongest overall health benefits. For the production of extra virgin olive oil only the best olives are used and no heat or chemicals are used when processing the olives. Cold pressed or first pressed olive oils therefore have the highest levels of antioxidants. Extra virgin olive has a very low acidity, while lower quality oils have a higher acidity and lower levels of nutrients. “Pure olive oils”, “olive oils” or “light olive oils” are to various degrees refined. For example, a so-called pure olive oil is made out of a blend of refined (chemically treated) and unrefined olive oil. Some cheaper olive oils only use refined oils and may even even contain a large amount of refined non-olive oils (more than half the content! ), such as sunflower oil. Buy Extra Virgin Olive oil, which is derived from the first pressing, has the most delicate flavor and strongest overall health benefits. Look for the term “cold or first pressed” on the bottle. This indicates that minimal heating is used during the production of the oil. Minimal use of heating during production guarantees the highest nutrient profile. Buy organic olive oil to ensure that no harmful chemical products are used either during the production of olive oil or during the process of growing the olives. Buy olive oil in dark tinted glass bottles. Exposure to light, even in the supermarket, will dramatically reduce the oil’s many healthy benefits. The oxidation, when the oil is sitting on the shelf for too long, can even pose a health risk and the rancidity can even cause inflammation. After just a few months’ exposure to light, free radical levels have increased to such a degree that the health benefits mentioned above are lost. Look for the initials “A.O.C.” or “D.O.P.” or “D.P.O.” or “D.O” on the bottle. “A.O.C.” is the French term “Appellation D’origine Controlée.” “D.O.P.” or “D.P.O.” which stands for the Italian “Denominazione d’Origine Protetta”. “D.O.” is the Spanish term for “Denominacion de Origen.” Any of these initials indicate the superior quality of these extra virgin olive oils. Store in a dark, cool place. Light, heat and air are olive oils worst enemies. Storing in a dark cool place preserves the taste of the oil and prevents it from becoming rancid. Rancidity can cause inflammation. After opening, use your oil within 1-2 months to ensure its healthy phytonutrients (chlorophyll, beta-carotene, phenols and vitamin E) remain intact and readily available. Can you cook in extra virgin olive oil? My answer would be Yes. Extra virgin olive oil is often recommended only for cold food preparations but if you visit Italy, Spain or Portugal, you will notice that many cooks use extra virgin olive oil for cooking too. Mediterranean cultures have been frying, roasting and sautéing in olive oil for ages and the Mediterranean diet is celebrated for its heart-healthy and cancer-fighting benefits for a reason. Extra virgin olive oil does have a lower smoke point than refined olive oils but it is also richer in nutrients. For sautéing onions, carrots and garlic at a medium heat or for use in slow oven-roasted dishes, I will always choose extra virgin olive oil. I don’t deep fry or grill meat or fish at a high heat so the oil won’t reach a very high cooking temperature. As long as you cook under normal circumstances, you are not going to reach the oil’s smoking point (around 160 degrees celsius or higher for extra virgin olive oil). When the oil is heated above its smoking point, you’ll notice it right away. The oil alters chemically and starts to decompose giving off a burnt, chemical smell. When this happens, cancer causing compounds (oxygen radicals) are released. Eating foods cooked in oil that has been heated beyond its smoking point or inhaling the smoke that is produced is without a doubt damaging to your health. This said, I would personally be more concerned about the abundance of trans fats, or the high concentrations of acrylamide in common food products, such as French fries, muffins, cookies, potato chips, or cereals. Both can lead to cell damage, inflammation and disease. It is true that acrylamide can also form when you fry starchy foods like potatoes in olive oil at a high-temperature but a little common sense goes a long way. The longer you fry or roast a certain food, the higher the acrylamide levels produced in the food will be. Quickly frying, sautéing some chopped onions, garlic and carrots in a sauce pan at a low or medium heat or slow roasting foods in the oven at a lower temperature will not be detrimental to your health. If you are still worried about the health risks or loss of taste (oil loses some of its flavour when heated) when cooking with extra virgin oil, simply use a high-quality olive oils to finish a dish after cooking. The only reason I can think of for not using extra virgin oil for cooking is the high price of extra virgin olive oil. Extra virgin oil can be quite expensive and cooking in extra virgin olive oil can feel like your wasting a beautiful, high-quality product as the oil does lose some of its flavour and nutrients when heated. Then again, extra virgin oil is so much healthier for you than the refined olive oils out there. I would rather feed my body with a high-quality product than use a refined, unhealthier type of (olive) oil. One Response to "All about olive oil"